Successive authoritarian regimes have maintained tight control over organized labor in Egypt since the 1950s. And yet in 2009, a group of civil servants decided to exit the state-controlled Egyptian Trade Union Federation (ETUF), thereby setting a precedent for other groups and threatening the ETUF's monopoly. 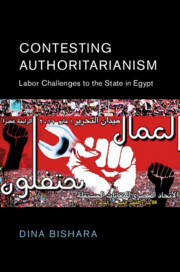 Dina Bishara examines this relationship between labour organizations and the state to shed light on how political change occurs within an authoritarian government, and to show how ordinary Egyptians perceive the government's rule. In particular, Bishara highlights the agency of dissident unionists in challenging the state even when trade union leaders remain loyal. She reveals that militant sectors are more vulnerable to greater scrutiny and repression and that financial benefits tied to membership in state-backed unions can provide significant disincentives against the exit option. Moving beyond conventional accounts of top-down control, this book explores when and how institutions designed for political control become contested from below. 2 - The Weakest Link?